Ogilvy & Mather unleashed a series of “house ads” in the late 60’s to early 70’s, which dazzled readers with its depth, and hooked more whale-sized clients than any house ads before or since. Many tens of millions were spent on these insertions in major publications worldwide. If you could pass through a time machine and transport to any agency of your choice, the direct response division of O&M, during the late 60’s-early 70’s, is where you’d want to be. Drayton Bird, Gary Bencivenga and David Deutch are all O&M alumni from around this time. “How To Create Advertising That Sells” is a remarkable 1,909 words long and draws on the direct response foundation laid by Claude Hopkins, John Caples and the statistical polling methodology David Ogilvy learned at Gallup. 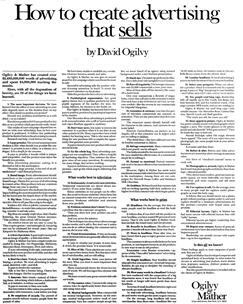 You can find Ogilvy’s commentary on this series of ads on page 65 of “Ogilvy On Advertising.” What…you don’t have “Ogilvy On Advertising?” I’m barring your IP address from this site until you get it…especially since you’re one of the few who possesses this ad word-for-word. And in case you haven’t looked at the book in a while, a sharpshooter assisted by an electron microscope would be challenged to make out the body copy in the ad. It seems the O&M series saw fewer and fewer insertions as Ogilvy’s influence over the agency weakened with time. However, these ads certainly left their mark. You can find a list of the other ads in the series here. So, while it’s true a freelancer could never handle the corporate giants these ads were designed to attract, far bigger and better paying clients await those with the guts and know-how to put this kind of ad together today. And with the 24/7 research power of the Internet, it’s possible to assemble the kind of data which once took whole departments, mere decades ago. Moreover, aren’t we all getting a little fatigued reading the same type of customer acquisition sales letters, promising the six secrets of psychological persuasion (and the like), some writer has labored months over. Here’s the O&M masterpiece, “How To Create Advertising That Sells,” in its original format. 2. Large promise. The second most important decision is this: what should you promise the customer? A promise is not a claim, or a theme, or a slogan. It is a benefit for the consumer. It pays to promise a benefit which is unique and competitive, and the product must deliver the benefit your promise. Most advertising promises nothing. It is doomed to fail in the marketplace. “Promise, large promise, is the soul of an advertisement” – said Samuel Johnson. Number 37: Editorial layout. 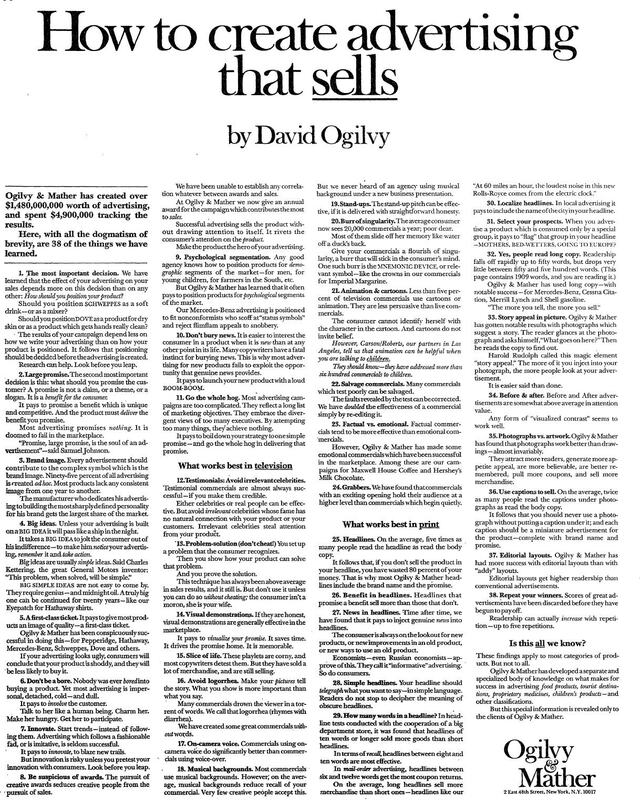 Ogilvy & Mather has had more success with editorial layouts, than with addy Layouts. Editorial layouts get higher readership than conventional advertisements. Number 38: Repeat your winners. Scores of great advertisements have been discarded before they have begun to pay off. Readership can actually increase with repetition – up to five repetitions. Hi, Any idea where we might be able to find the O&M series of in-house ads? Here’s a challenge… find the old Gary Halbert ad from the Akron Beacon Journal from the 70’s where he made fun of fat people. Also, I’ve never actually seen his Tova perfume launch ad either. Everyone talks about the headline, sure, but the ad itself? Hmm… it’s got to be somewhere. Hopefully these are not lost to time. headlines between 6-and-12 words get the must coupon returns. Wondering if you can help me out with something as the Webs resident ‘direct response master archivist’. I am searching for the stats on David Ogivly’s campaign for Shell when he did the booklets and drove millions of people into the stores. Do you know where I can find them? I think they are in ‘Legendary Gary’s’ 100 course book, but I haven’t been able to find them yet. I’ve been wanting that one for a while too, John. Since these little booklets were distributed at the petrol stations over 30 years ago, they’re a challenge to get a hold of. Maybe an eBay alert will bear fruit if you’re patient. Should read “detest” NOT “detect”. Harsh… the transcriber was Jack Daniels. Eben Pagan sent me here! All this time later the same basic principles yield better results than most of the marketing guru speak. This stuff still works. Sure you have to tweak it a bit but still…time tested and true. Red Ridge Millwork & Design Ltd.